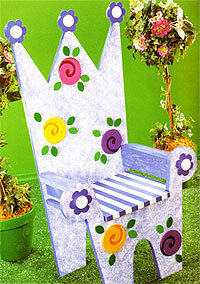 With its bold colors and striking presence, this fantastic throne can be a great showpiece in any child's room. The wooden glue-ons used in this particular project follow a floral theme, but you could draw from other decorative elements in the room to suit the royal fancy of your own prince or princess. Sand and prep all of the chair components, then paint everything with two coats of Wicker White, sanding lightly between coats. Paint the chair seat and the circular inserts for the tops of the "spires" with a solid coat of Dark Hydrangea. Brush the arms lightly with Dark Hydrangea, allowing the white undercoat to show through. Use painters' tape to mask off stripes on the seat. Starting at the left side, place the tape vertically across the seat from front to back. Remove every other piece of tape, exposing the Dark Hydrangea. Using the ½" (12mm) stencil brush, pounce the open areas lightly with Wicker White. Make sure you don't create a solid line. Using a damp sea sponge, dab Hydrangea randomly over the entire surface of the chair, including the backside, creating no noticeable pattern. Paint the edges of the back and front of the chair Dark Hydrangea for contrast. Paint the flower pieces with Dark Hydrangea. Paint the caps and the plates with Wicker White. Paint two circles the Red Violet, two with Tangerine and one with Magenta. These will make up the bottom sections of the swirl flowers. Paint two swirls with Medium Yellow, two with Lavender and one with Butler Magenta for the tops of the swirl flowers. Paint nine footballs with green and thirteen footballs with Bright Green for the leaves of the swirl flowers. Referring to the photo for placement, use wood glue to attach all the glue-ons to the chair. Once these have dried, use the glue and screws provided to assemble the chair. Spray the chair with matte spray sealer for protection.